Hello everyone, today is the last free chapter for Broken, Chapter Four, for those of you who have had a taster and want to know more. I hope you will buy a copy of the book, a percentage of the money from the book will be going to a well-deserved charity. Seren, is an organisation that counsels people who have experienced child abuse, they are vastly underfunded and their waiting lists are long. Anyone here who has been through this will tell you, that the effects are far reaching. If just one person is helped by reading this book then my journey in writing it will have been worth it. 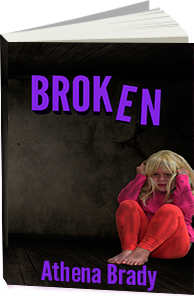 Broken is due to be released soon on Amazon, please keep tuned to the blog for the exact date. So without further ado, here is Broken Chapter Four. Mary walked into their bedroom with a heavy heart, how had she ever got herself into this mess in the first place? He had seemed so nice at first and she thought their struggles would be behind them when she married him. All she wanted was a good life for herself and her children but almost as soon as the ring was on her finger he had changed, into a jealous possessive monster. If she left him he would make her life a misery, he knew too much about her past and he would use this information to destroy her; No she had to keep him sweet until she could find another solution. “Mum you don’t have to go into work tonight; I earned your wages for you” as he presented her with a pocketful of coins. The look on his little face of disappointment was heart breaking; but those few coppers wouldn’t have made any impact at all on the bills that had to be paid; but she was very touched by his thoughtfulness none the less. She put on her Carmen rollers on to heat up and as she brushed her long auburn hair until it shined, she thought about times past. When she had been with the man she loved, in fact the only man she had ever loved. How had her life turned into this pitiful existence? That’s so selfish she thought to herself, as long as the children were happy then she would cope. Brushing away the tears, she applied her makeup skilfully and then began to select her outfit for the evening. She choose a black and white striped pencil dress that hugged all the right places and remembered a time long ago; when the man she loved had given it to her, as a present.